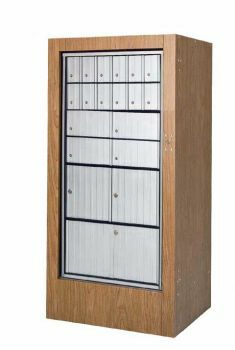 Constructed of 16 gauge vinyl-coated steel, these heavy duty units are designed to hold 4 (four) 2200/2900 series PO Box Modules,or HSS Industries' line of 24" inch Parcel Lockers and Mail Drops. The inner cabinet rotates 180 degrees so that the rear faces the front. After distributing the mail, the inner cabinet is rotated back to the customer position. An optional rear cover is available if the unit is not positioned against a wall.